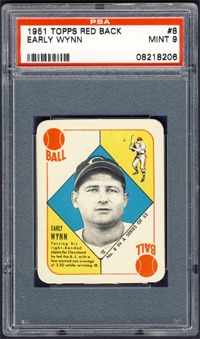 After a so-so career with the Senators, Early Wynn was traded to the Cleveland Indians in 1949 and became a big winner. He won 20 games for the Indians four times and had eight consecutive winning seasons. 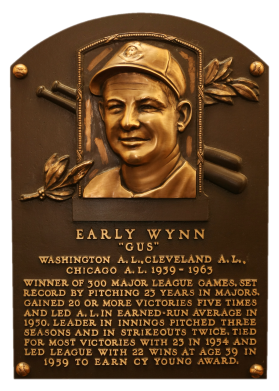 Traded to the White Sox after the '57 season, "Gus" led Chicago to the pennant in 1959 by winning 22 games, plus the Cy Young Award. Wynn's all-business approach was pretty well summed up when he stated he'd knock down his grandmother if she dug in against him. He had a 300-244 career record and a 3.54 ERA. 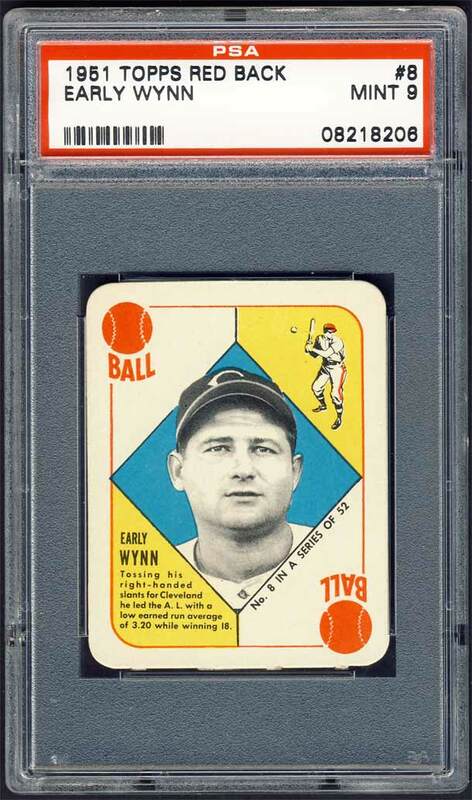 Comments: The first Wynn portrait was a 1958 Topps YL PSA 7 when I won a Mark Irodenko / Outfield Sports eBay auction in January, 2000. In July, 2004 I upgraded to a PSA 8 after winning another eBay auction from Wayne Varner / Shoebox Cards. 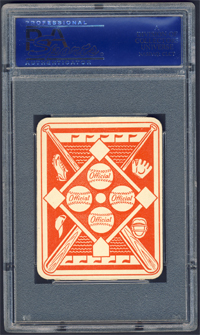 In November, 2007 I swapped the card out in lieu of this 1951 Topps Red Back. 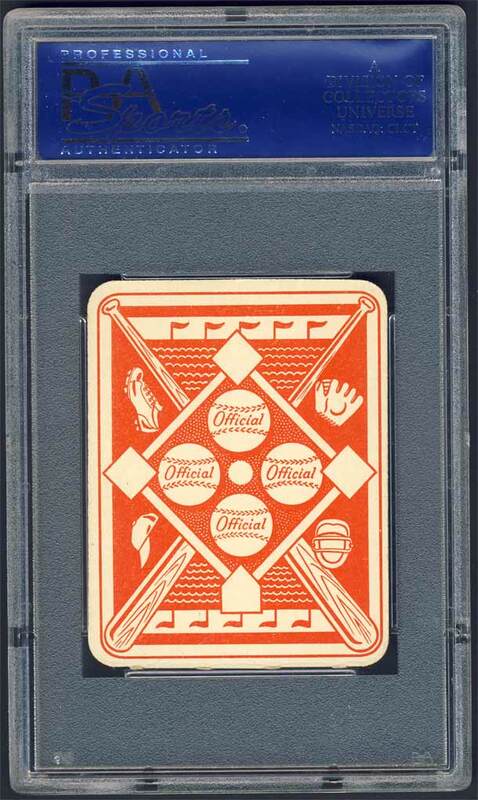 I won it on eBay courtesy of seller Leighton / Just Collect. 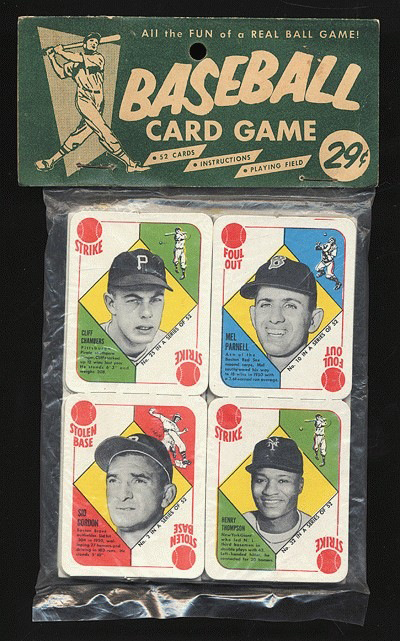 Description: Like the Blue Backs, the Topps Red Backs which were sold at the same time and came two to a package for 1-cent. Their black-and-white photographs appear on a red, white, blue, and yellow background. The back printing is red on white. Their 2" X 2-5/8" size is the same as Blue Backs. 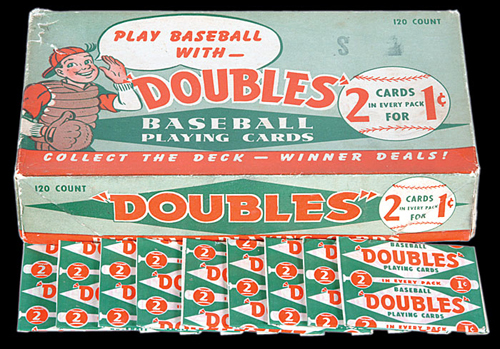 Also identical is the set size (52 cards) and the game situations to be found on the fronts of the cards, for use in playing a card game of baseball. Red Backs are more common than Blue Backs by virtue of a 1980s discovery of a large hoard of unopened boxesl. Red Backs are also known to have been sold in a plastic-bagged set along with a foldout paper game board for 29 cents.